Today Faith is hosting her annual Christmas Card Carousel. One of my favorite things about the holiday season is getting all of the fun Christmas cards in my mailbox each day! It was so fun choosing a Christmas card this year because we finally have the perfect little blessing to feature. :) We used 2 different Christmas cards this year. Looking at our cards this year reminds me of just how blessed we are. For my sweet friends waiting to add a little star of your own, please know you are always in my prayers. I spike Jarrett's hair like that too! This our first "official" Christmas as a family of three also. He was born December 21st last year, but we got to come home on Christmas Eve! But, I got the greatest gift of all :) Merry Christmas! Hi there! 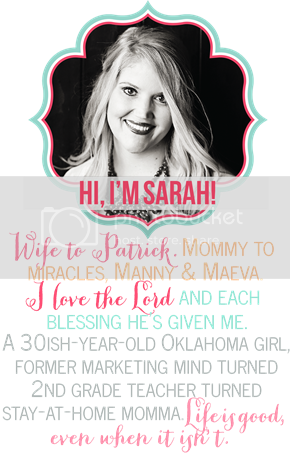 I happened upon your blog and I've got to say what an awesome blessing you've received!!! Such a wonderful miracle! 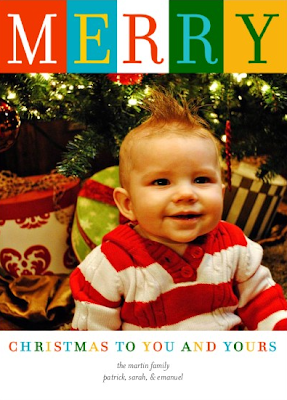 Love your Christmas card and your little man is just adorable! I found your blog through Faith's, and I love your card! Especially the back of it, I love the red, black and white theme, and the pattern too! Beautiful!!! The pics from E's 6 month shoot are so great. You do have the perfect blessing on your card this year. Love it!! Love them..He is so Precious! Love your card. Merry Christmas! Such a great card, and a beautiful blessing! We used the same verse on our cards last year. Enjoy your first Christmas as 3!! i love your cards! i also had the free shutterfly cards from my blog! wasn't it fun to have two separate cards this year?! Love, love, love the cards! Hope y'all have a Merry Christmas!!! He's so precious! Love your card! Cute, cute, cute... as always!! Merry Christmas! Both cards came out great, I especially love the font on the first card. You truly are blessed, have a great Christmas making memories with your new addition! I love both! I just cannot believe how cute E is!!!!! Seriously. He is just precious! I love both Christmas cards - they are both adorable! I can never get my act together to get cute Christmas cards done....oh well - always fun to see everyone else's! Your Christmas cards are so cute! You have an adorable family Sarah. I LOVE that family picture, and all of them for that matter! What a sweet family. E is just precious! Merry Christmas! I was so impressed with the Shutterfly cards! So glad you shared that info. Saved my a bundle! I love both cards. They're so cute! I'm one of those you're praying for & I thank you for that. Your cards are adorable! I love them both! I love reading your blog - your story is so sweet and your crafts are amazing! Merry Christmas! am i seeing things or is your son's name spelled differently on ea card??? Oh my sweet goodness. That child is ADORABLE!!!! Adorable cards! Your little boy is precious! Merry Christmas, indeed! Cute cards. Our boys are just about the same age. Carsyn is 7 months 8 days old. The pictures are absolutely gorgeous!! I know the card made everybody smile when they opened it. love the card. so glad shutterfly did the christmas card promo! i hope they do it again next year. Your family is absolutely adorable! I just stumbled across your blog through another blog that I read, so I wanted to stop by and say Hi. Love all your creativity. Thanks for the blog header tutorial as well. Happy Holidays to you and your family!